A year ago, a friend of Pala International told us that, on December 29, 2005, twenty-four miners were killed in the Kohistan region of Pakistan’s North West Frontier Province. As we reported at the time, the mines in this region are usually abandoned during the winter months. We conjectured that, after the devastation of October 2005’s earthquake, miners might have been desperate enough to brave elements and aftershocks (the probable cause of the avalanche). 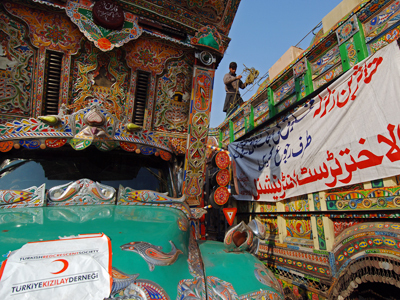 This month, we review select developments in Pakistan over the past year. First, a follow-up on the earthquake, then a look at progress on last year’s “new initiative” for gems and jewelry and a gemology school partnership, and finally a visit to the mines. about 400,000 people face a second winter without permanent shelter in the mountains and valleys of northern Pakistan, according to the International Federation of Red Cross and Red Crescent Societies. The UN says there are about 35,000 people still living in 45 tent camps and agencies are expecting at least another 20,000 to come down from the hills in the next couple of months before winter, when temperatures can drop to -15C or -20C in the highest villages. [T]he progress of recovery has been patchy, and the pace of construction of housing and infrastructure has been slow. At least 1.8 million people have not begun rebuilding their homes; most of them are in makeshift shelters that offer limited protection against the coming cold. Trade decline. This chart illustrates how desperately the gem trade is in need of a boost. As of 2002-03, Pakistan’s gem exports were valued at $1.9 million, with jewelry at $21.2 million (Daily Times). The latest Export Promotion Bureau presentation, however, shows that gems and jewelry exports have actually been dropping since 2001, from $28.5 million (2001–02) to $17.4 million in FY2005-06. 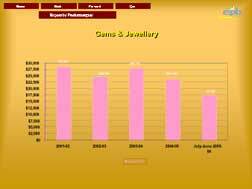 Pakistan obviously would like to cash in on the projected increase in demand for jewelry projected by its neighbors, India and China (see “India and China Jewelry Demand to Surge” in this issue). Its trade with China has remained flat over the last two years, but trade with India has increased from 1.53 to 5.85 percent of total exports, according to a Federal Bureau of Statistics report (this is a small slow-loading PDF). 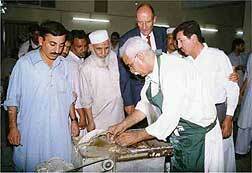 German Ambassador Dr. Christoph Brummer (in suit) receives lapidary demonstration at GGIP, July 2002. Last June, the Gems & Gemological Institute of Pakistan (GGIP) announced a partnership with the Asian Institute of Gemological Sciences (AIGS) “that will enable the GGIP to become a world-class gemological institute,” according to a press release from the United States Agency for International Development (USAID). “The USAID is funding the AIGS to assist with the new partnership under the Pakistan Initiative for Strategic Development and Competitiveness (PISDAC).” PISDAC, part of a five-year, $1.5-billion USAID assistance package, is managed by J.E. Austin Associates. GGIP will be able to offer all courses currently available at AIGS/Bangkok with certificates and diplomas provided through the newly formed AIGS/Pakistan. These certificates and diplomas will be internationally recognized and will be based on completion of coursework meeting AIGS standards. The relationship between GGIP and AIGS began due to the successful participation of the sector strategy working group under the Gems and Jewelry Pakistan brand in the Bangkok Gems and Jewelry fair in September 2005 where Pakistani companies received more than $4 million in orders. [t]he project has also led to significant policy reforms within the industry because of an effective public-private partnership. Some of the reforms have made the gems and jewellery sector an industry rather than a retail-enterprise and resulted in elimination of sales tax and custom duty on import of machinery and equipment used for gem mining and extraction and processing of gems and jewellery. sadly it was still not clear if foreigners would be allowed to study in the future at the GGIP. Nevertheless studying both gemology and gem cutting in a traditional trading center like Peshawar is in my opinion one of the best choice for a young person willing to discover the fascinating universe of the gem trade. 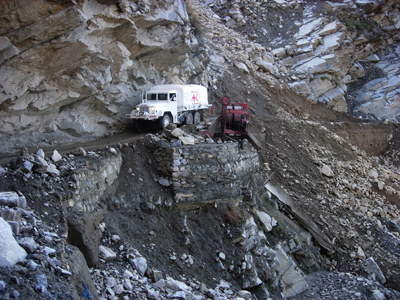 Even in warmer months, landslides can be a problem, as Asian Institute of Gemological Sciences lab director Vincent Pardieu describes during his Summer 2006 field trip. 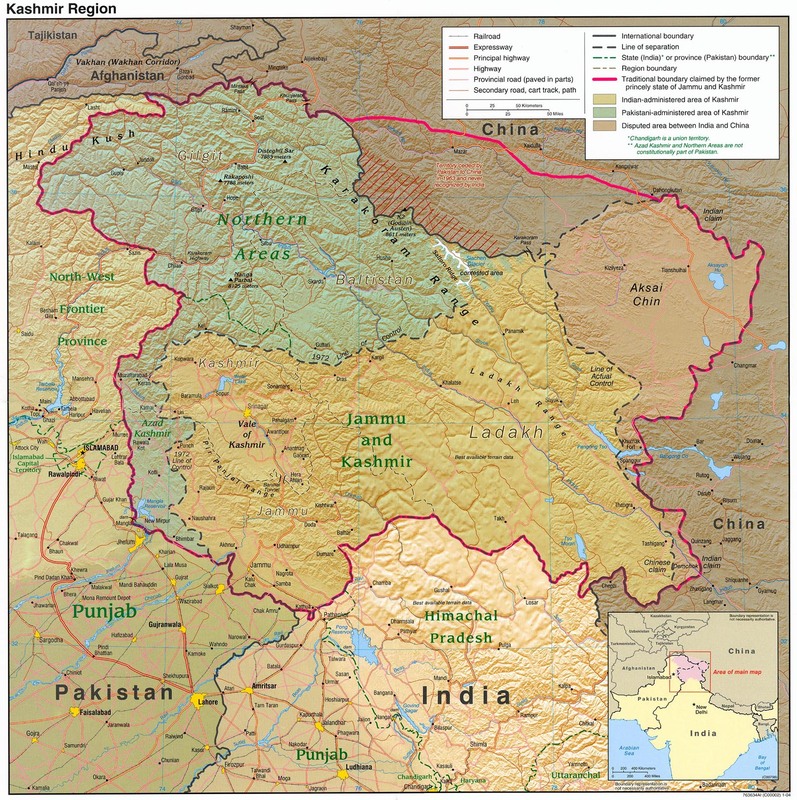 In August, he visited the Nangimali ruby mining area in Azad Kashmir, near Kel (see map) in the Neelum River valley, and only was able to take cars from landslide to landslide—five in all. He credits the 2005 earthquake for the instability of the terrain. A government website (May 2005) claims that the Nangimali area has potential deposits of 24,900 million grams. 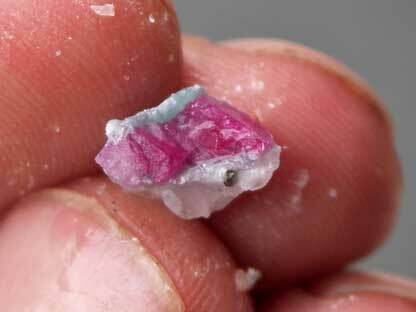 The deposit, at 4,400 meters (14,400 ft.), is claimed to be the highest ruby deposit in the world. The website states that the material compares favorably with Burmese ruby. Pardieu also visited mines at higher elevations. The topmost mine (Nangimali Top, alt. 4,400 m.) was not currently in production. Few years ago up to 50 miners were nevertheless working at Nangimali Top but the best stones were told us to have been produced at “Lower Khora.” This mine has the same name as the alluvial mine located several hundreds meters under. A visit to Lower Khora (an open pit mine in 1994) revealed a “ruby bearing layer was extending at least 150 meters inside the cliff....” Pardieu was told by the mine director produced “3 to 5 clean top quality crystals over one carat per week.” The working season is traditionally three-and-a-half months per year. Pardieu saw very little material from this area in the Namak Mandi gemstone market of Peshawar. 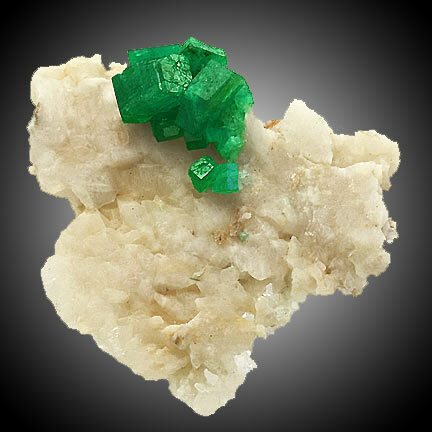 Earlier last summer, Pardieu visited an emerald mine near Mingora, in the old princedom of Swat, in central North West Frontier Province. Mining there, while temporarily suspended, was conducted by open pit and tunnel. 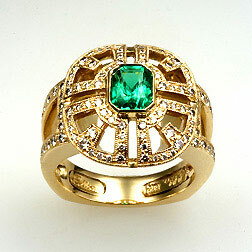 In the Mingora and Peshawar markets visited by Pardieu, it was said that the largest cut emerald of fine quality from the region was 5 ct., whereas most stones were under 1 ct. Emeralds have been linked to this area dating back as far as the Gallo-Roman era, according to Scientific American.